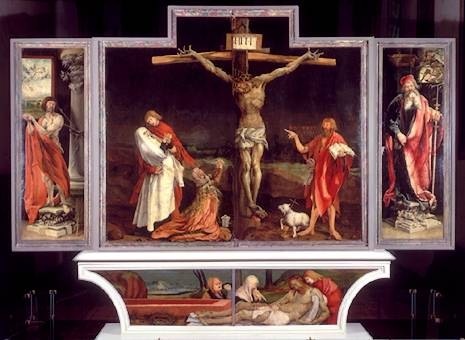 Painted in about 1515 by Matthias Grunewald, the three part work sits on top of a painted altar. There is much to learn and understand about the painter and this piece and Wikipedia is a far better place to begin more research than here. But, I want to look specifically at the middle section and even more specifically at the body of Christ, as Grunewald depicted it. The Isenheim Altarpiece was to be placed in the chapel of a sanitarium where patients with skin diseases were hospitalized. Grunewald painted this Christ as a suffering, contorted being with terrible lesions all over his body. Here was a Christ with whom the people of Isenheim could relate. This was a Jesus who was like them, suffered like them, and- they believed- died for them. This was a Jesus with scars. This was a Jesus who died alone, unappreciated, unloved, shunned. This was a Jesus who who screamed in pain before he died. And amazingly, John the Baptist was painted to the right of the cross, pointing to Jesus and saying, “He must increase: I must decrease.” This was a suffering Christ, but a Christ who, according to the Baptist, should, could, and must be emulated. Meanwhile, Palestinians in the Gaza Strip are being pummeled by Israel with nary a whisper of protest from American Christians. Most of the world’s children end each day hungry. There are more slaves in the world than at any time in history. We (US) are spending $12 billion a month to fight a war over..what? I’ve forgotten. The high school drop out rate is higher than ever. We are the most incarcerating country on earth. And we (Christians) actually send money- lots of it!- to scriptural pimps who promise if we send more money to them, we can have bigger houses, shinier cars, better clothes, no cancer, great kids, vacations on Christian cruise ships, to Christian hotels, near Christian theme parks, after stopping at the mall to buy Christian CDs, Christian knick-knacks, bumper stickers, and jewelry, so that atheists and Muslims and Democrats and lesbians will know- without a doubt!- where we stand on the issues! Unless the church begins to bleed, it will die. He must increase; we, fat and healthy and happy and lazy, must decrease. I worry about calling for justice for Palestinians. The bombings are horrible, yes. So are the rocket attacks they’ve been mounting against the Israelis. Proportionate response didn’t stop the rockets. Doing nothing to retaliate didn’t stop the rockets. Israelis want their children to be safe. I understand that. And to the person asking what Israel needs to do in order to keep their children safe… how about this, they can try to comply with UN resolutions demanding that they stop occupying Palestinian territories. If they want peace, they should stay on their side of the border. Weeks of rocket attacks killed a whopping 4 Israeli civilians, while the Israelis have killed hundreds of Palestinian civilians during the same time period… its pretty clear which side needs to stop first. Israel stayed on their side of the border. The rocket attacks continued. 2,000 rocket attacks a month may sound trivial, with only four deaths — but so few deaths is a tribute to the bomb shelters the Israelis have built and their preparedness, and their alert system. So, Israel stopped — with a UN negotiated cease-fire — but Hamas didn’t. How do the Israelis get Hamas to stop launching rockets? Israel did what you asked, and it didn’t work. This whole situation makes me crazy. If Israel stops, again, will the rockets stop? History tells us they won’t. quidsit is ALWAYS good for intelligent (even though it is sometimes, once-in-awhile, disagreeable) thought. I have no solutions sitting here in small-town Texas, a half a world and a whole different worldview away. I think I am most interested in considering that others’ perspectives are valid, and in reminding my own Christian brethern and sistern [sic] that Palestinian children- Christian, Muslim, or agnostic- bleed, scream, and are beloved of their families. They are NOT NOT NOT mere cogs in some fundamentalist fairy tales of the end-times. They are NOT steps on the way to 40 perpetual virgins for some, or golden streets in the New Jerusalem for others. The planet is dying because someone always has to win. In blindness, we believe that winning moves us forward, but exactly the opposite is true. There has to be a way to think besides “The Game” model. I recognize the passions and the insights that are flying around due to this post’s call to action, and I salute you all. I comment simply to say thank you for giving me a moment to look at this piece of art and really soak it in. A new experience for me, to really SEE scenes of the crucifixion and begin to drink in their power and meaning. I was lucky to find your thefirstmorning.wordpress.com site. I’m so surprised by your way of thinking and writing. Have you thought about writing a book?